After a weekend of reading Poe’s poems and short stories, I picked up my next novel, one that has been sitting on my shelf for a while now. I had a hard time picking what I wanted to read next; there seemed to be too many good choices. So, I solicited some advice from a message board I follow and one person said that whenever they are confronted with that problem, they try to knock out a few of the shorter books that have been sitting there a while, rather than jump into a dense, long or otherwise heavy endeavor. 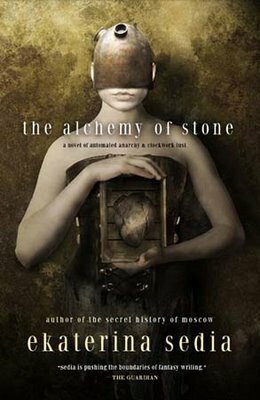 Finding that sound advice, I picked up Ekaterina Sedia’s The Alchemy of Stone. It is an urban steampunk fantasy about an automaton with a clockwork heart in a city rife with political strife. The two main parties are the Mechanics and the Alchemists. A mythical race of Gargoyle’s watches over the city, but remains aloof and uninvolved in politics. So far it is an interesting, if not stellar, story. And it’s both short and a quick read. I’m enjoying it, but there’s nothing really revolutionary for the steampunk genre to be found here. It’s more of a card-carrying, law abiding citizen of steampunk-ville. But still, worth a look if you like that genre.